French I Am Alive Report Was "A Joke"
French gaming site JeuxVideo says its report that Ubisoft's I Am Alive would get a digital-only release was "just a joke," but it's the internet's fault for not understanding what was obviously a joke. 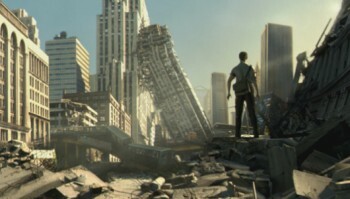 A week ago, JeuxVideo revealed that I Am Alive, the disaster survival game Ubisoft hasn't said a word about in nearly two years, would be given a digital-only release on the PlayStation Network and Xbox Live Arcade because, according to Ubisoft Toronto Managing Director Jade Raymond, the publisher didn't have enough faith in it to sink the bucks into a proper retail launch. It was the kind of harsh, frank assessment you don't normally hear from a publisher and that, combined with the fact that it was the first thing we'd heard about the game since early 2009, drove the story around the internet very quickly. Just one problem: it was a lie. Or, as the site put it, "a joke." The whole thing started to look fishy almost immediately after the story came out, when several of our own French-speaking readers noted that the statement about Ubisoft expecting the game to fail did not come from Raymond but were just the opinion of the announcer. Ubisoft itself denied the statement, saying, "We have not recently announced anything for I Am Alive and we have nothing official to announce at this time." And now JeuxVideo has stuck the final fork in it, saying that the whole thing was just a joke and we all should have known it. "To get it all on the tone of humor, Kevin [the JeuxVideo announcer] improvises a story about a relationship he enjoyed with Jade Raymond and which would have allowed him to get this info. Obviously, anyone who has watched Warpzone immediately understood it was a joke," the site said in a Google-translated explanation. NeoGAF got the ball rolling "without worrying about the context of the issue," after which English gaming sites began to report on the story. "That's what happens when you don't understand French" and, due to "laziness or complacency," don't bother to verify facts, the site said, despite the fact that many sites did in fact reach out to Ubisoft for confirmation, which is how we ended up with a denial in the first place. Still, that might have been the end of it as far as JeuxVideo was concerned, except that French gaming sites began to report on it as well, apparently taking NeoGAF at its word without checking the original video, where they would have discovered the obvious humor. But JeuxVideo is prepared to be big about it. "Although our responsibility in this story is zero, we still want to apologize for the misunderstanding [of] this innocent trait of humor," it said. The most important thing, it added, is that it now has proof that Jade Raymond does occasionally look at the site. I suppose we should expect nothing less from the nation that awarded Jerry Lewis the LÃ©gion d'honneur for his contributions to comedy.